Rain or snow, our zinc galvanized door canopies will keep you and your door dry. This canopy has just been fitted onto a beautiful cottage in Cornwall. This steel door canopy has been hot dip zinc galvanized before being painted with several coats of matt Black paint to ensure a very durable, long lasting finish. 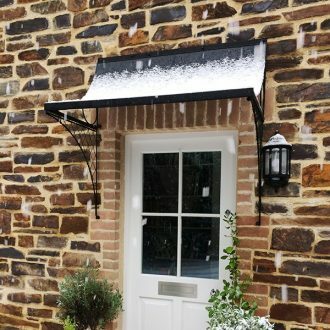 Thank you Mr Anderson of JAA Architectural Design for the glorious image of your new canopy taken on a snowy winter’s day, a perfect example of ‘form follows function’ in action.